A team of Simon Fraser University senior engineering students from various disciplines, which was earlier awarded a Special Grant, reports that they finalized a proof-of-concept model of a dual-source electrical energy generator which harvests energy from photo-voltaic cells and pedestrians walking over floor/path tiles. 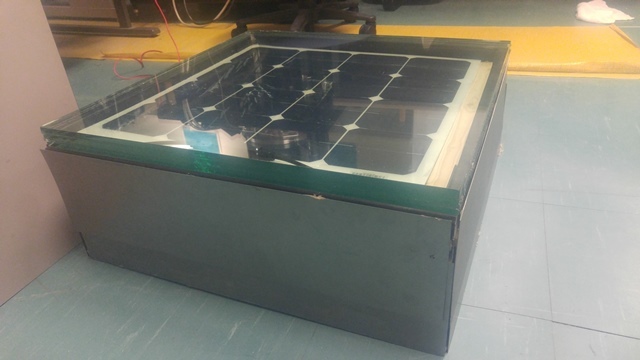 Their design task was to create a relatively inexpensive and low-maintenance weatherproof energy harvester that can be installed outdoors or indoors in high-traffic pedestrian areas (sidewalks, pathways, staircases, etc.). The prototype generates power at 12 V DC, and can charge a lead-acid battery or supply a nearby load. 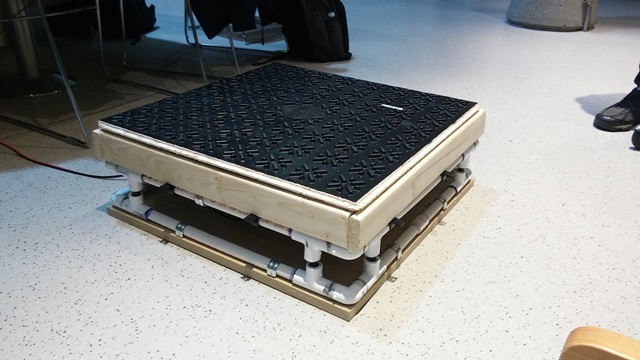 Its weight support of over 90 kg of continuous or sudden load exceeded the initial expectations. Their professors praised the achievements recommended further refinements, and suggested asking the school for a permanent installation. The team found this very rewarding, in addition to having benefited greatly from working together, learning from each other, and acquiring new kills. The IEEE Canadian Foundation awarded Centre Wellington District High School in Fergus, Ontario a one-time Special Grant to participate in a Skills Ontario event. The school project was to build a robot that could collect, and assemble a boat as outlined by the Skills Ontario competition. Their larger objective was to lay the foundations and ground work to build a successful robotics program at Centre Wellington District High School. The school team completed a robot and competed regionally against Erin District High School. The robot performed well, but some problems were realized that need more attention in the initial stages of design. The project allowed the participants to get familiar with Arduino, coding and electronics. The students who worked on this project came back and built another robot for the next Skills project. Some of these students went to technology related programs at colleges or universities. Another very important result of this project was the confidence to continue with a robotics program at the school. Donations to the IEEE Canadian Foundation support this program in Canada. This new Scholarship, first award expected in 2018, recognizes Dr. Nick Cercone (1946-2015) a well-regarded Canadian educator, researcher and IEEE Fellow. The successful candidate will be a computer science PhD student at a Canadian university who shows exceptional promise in making impactful research contributions that will have real-world applications outside Computer Science. Computer Science is a field of studies of interest to IEEE. This new scholarship, first annual award in April 2017, recognizes Dr. Raymond D. Findlay, well known as a leader in IEEE (Past President IEEE), IEEE Canada (Past President IEEE Canada), educator and researcher and IEEE Fellow. Criteria include: citizen or permanent resident of Canada, IEEE Student Member, completing penultimate undergrad year, full time, GPA > 80%, females strongly encouraged to apply, judged on merit. The successful candidate will have submitted an original essay of up to 500 words that provides evidence of leadership, creativity and success under adverse conditions. The enthusiasm about being an IEEE student member becoming a professional engineer should radiate through the writing style.